How to delete a user's folder in Windows 8.1? I have a laptop which is being given to a different employee. I added a new Administrator account and deleted the old one. I deleted the User from the Windows 8.1 user utility thingy. So the user is gone, can't login, that's good. Problem is, in Explorer, he's still there. Let's call the guy Bob. So when I navigate to C:\Users I still see the \Bob directory. I don't want to see Bob any more. Can someone please tell me how to remove C:\Users\Bob? When I try, it goes on forever (says it's deleting some 12 gig of files - which don't exist in that directory) then hangs on a couple of system files. Bob's gone and not coming back, I'd like his user directory to do the same. You can delete this user folder with a graphical user interface, no need to use command lines there. The C:\Users\Bob folder will be deleted. 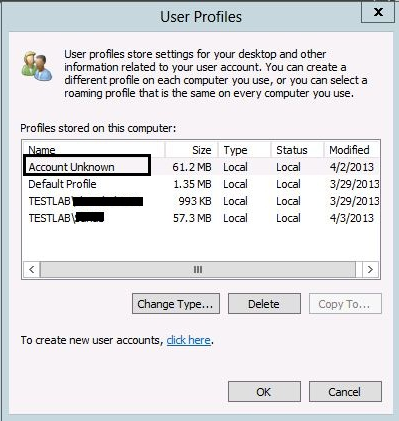 When you delete the user account, it does not remove the profile folder, and now that the folder is no longer associated with a user profile, it will be listed as "Account Unknown" as you observed. You can safely delete any "Account Unknows" from the System Properties dialog, but this may still not completely remove the users' directory. If it has not, and User\Bob is still a thing and not canned like his sorry a$$ was, then you should be able to manually go through and delete the profile. Sometimes these profiles can go very deep, with lots of nested folders that do not delete properly, or even locked files. Taking ownership of the folder and giving yourself Full Control of all the folders, subfolders, and files, should help, as well as shortening the names of any folders that may extend beyond the path length limit. Delete a few subfolders at a time, rather than just trying to get all of them in one go. Remove Read Only permissions on the files. Make sure you've got the appropriate permissions on your own account to do the deletion. Reboot the computer to make sure any open files are closed (thumbnail caches are worst about this). Kill explorer.exe and use Taskmanager to delete really tough files. For the absolute worst files that just refuse, use a bootable disk that allows you to mount the local drive and control it and remove the offending files. Be VERY careful if it comes to this though. Options ... Change Folder Options ... View Tab ...Show Hiddeden Files and Folders. You could try to delete the profile. 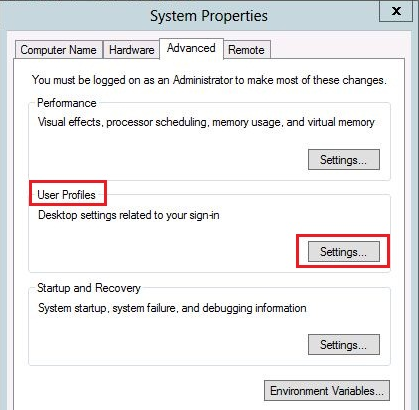 Open System Properties, choose the Advanced tab and select "Settings" in the User Profiles section. This will bring up a list. If Bob is listed in there, you can try deleting which should clear up all associated registry keys, directories etc. For future reference, Win8.1 (and probably Win8) has a built-in repair console that let me delete an old user folder that I could not delete from within Windows. Not safe boot's command prompt mode, but a direct boot to console. It boots from a tiny X: drive, and at this point C: is the special boot partition, so your real C: drive is D:. In D:\Users, I was able to use "RMDIR /S badAccountName" to quickly delete all of the folders. The harder part is getting to the repair console. Log out, then hold shift and click the on-screen power icon and choose "Restart". Keep holding shift as it restarts, and you will get a menu of repair options. Choose "Troubleshoot" and then "Advanced Options" and then "Command Prompt"
You will need to log in with your working account, and will then get a command prompt on the X: special boot drive. Change to D: and dir to confirm that it is your normal C: drive; if not, use DISKPART to list the various drives and volumes to figure out where your real drive is. Go to safe mode (msconfig, enable safe boot) delete the pesky folder period! Given what you have said I would go to create a bootable device (CD/DVD/USB, USB my preference) running something like, lets say, SYSRESCUE, and boot on this and elect to run a "file manager" of some sort (like Midnight Commander), does not really matter what as long as you can see NTFS drives and is known to be reliable. Then go ahead and navigate your way to the problem area and delete. I do this for similar issues but would not have spent as much time as you have thus far, I head to this method fairly quickly if it is obvious something it giving me an issue. This also stops 'windows' from having any hooks active against the files you are wanting to remove, basically stopping windows from interfering with your task. There are other bootable OS options of course. Easier than you might think... main problem is the apps folder(s) under the user's name contain hidden folders which are linked to programs that might keep processes running in the background. First, make sure you are logged on as as an administrator. Next, go to File Explore and click 'Show Hidden Files and Folders.' Then, go to C:/Users/'the_user_name'/App Data, and ... Look for folders with names that refer to programs, such as Real Player. Now, go to Task Manager and end any and all processes related to the folder name. Once the processes that had a lock on the folder are ended, the folders can be deleted forever. Error when removing a user profile in Windows 10? How to delete account folder from desktop? A proper way to create non-interactive accounts? Is there any way to run an application as another currently logged user without needing its password? Recover accidentaly deleted Win 8.1 user account and get back to his session while it is still in the system?